Hosanna! 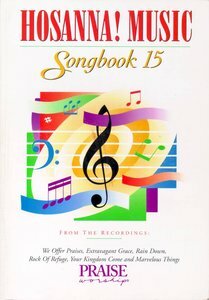 Music Songbook 15 features over 70 songs from Hosanna! Music's We Offer Praises, Extravagant Grace, Rain Down, Rock Of Refuge, Your Kingdom Come, and Marvelous Things. Arrangements for piano, organ, and four-part harmony are included plus worship tools like medley options and indexes for key & tempo, Scripture references, first line, topic, and copyright holders. About "Hosanna Music Songbook 15"